You had a pretty slow weekend, but you're still in quite the mood today. Could it be that someone in your personal life annoyed you last night? Well, don't take it out on your underlings. Let Ponyboy be your inspiration, and prove Robert Frost's poem wrong. 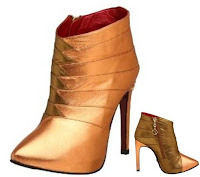 Remain unchanged by external factors, and embrace your resilient "youness" in a pair of gilded heels like these Jolene Booties by Strutt Couture (available at endless.com). The 4.25 inch heel allows you to rise above all pettiness, and the armadillo-like styling says you've got a tough exterior. However the green symbolizes the freshness of your spirit and the gold nods to your unchanging essence. Yeah, forget what happened yesterday, and work on embracing the new challenges the week will bring. Besides, it's the holiday season, so that let all the tinsel and glad tidings bring you joy. If you can't do it on your own, ask your bartender for a little help from a Yuletini (Conceived by James Hall from Circo in the UK and courtesy of The Liverpool Daily Post). This bit of holiday cheer without hangover fear blends Godiva dark cacao liquer with Goldschlager. It tastes like a chocolate cookie with cinnamon on top, and the gold flakes add just the right amount of festivity. This is a great Monday drink, too, because it'll take some of the edge off yet leave you with your wits for Tuesday morning. Booze News: Happy Repeal Day!! !